This product is a bit out of the grip physical design tablet computers in general. Is it more convenient? Or even vice versa? Instead of making a tablet computer as thin as possible, Sony actually makes a thicker. However, the thickness is tiered. Thickest area located at the end of the tablet computer and the other end made thinner. This makes it look like a buffer, especially when you put it on the table. The advantages of this kind form can be seen if you use at the desk, this tablet computer will feel a little more comfortable, especially when used to typing. Then for ebook readers with a portrait orientation, the design gives a sensation like the reader is holding the book with one hand folded to the back yard. Unfortunately, this design effects does not feel when tablet computer used on your lap or when held horizontally (landscape). Sony Tablet S comes relatively clean out of knick knacks all over its body. 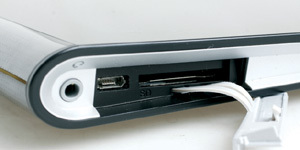 On the left side you’ll find a headphone jack, USB port and SD card slot. This computer uses a standard-sized SD card not micro-SD such as tablet computers in general. While on the right-side tablet there is a power button, volume and reset. You will not find a SIM card slot in this computer because the device only supports Wi-Fi (as a means of connection to the virtual world). Sony was designing its own charger used to recharge this tablet computer batteries. 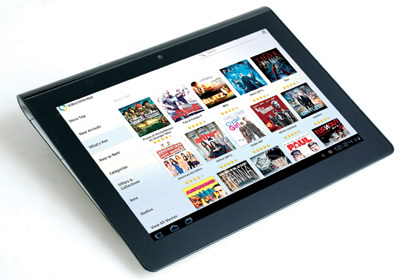 The computer screen tablet 9.4-inch sized with a standard resolution 1280×800. The screen also has a technology “TruBlack” heritage HDTV Bravia series. As a result, Tablet’s screen is fairly good with the brightness and contrast of fit. Only, it seems quite unfortunate that the front layer of the screen is vulnerable “injury”. So, you have to be somewhat careful or adding a screen protector. Armed with Nvidia’s Tegra 2, all the activity going pretty smoothly on this product. Several times we experienced a slight lag while exploring the internet site, but it was not significant. Several benchmark applications and games that we tried out into tablet computer can run smoothly. In terms of gaming, the Tablet S already PlayStation certified so you can play a lot of PS1 games (two of them are included). For entertainment, Sony provides services Music and Video Unlimited. Although the design is arguably somewhat eccentric, overall, the Sony Tablet S is a solid product. With enough qualified components, application support, and complete service, apparently not difficult for him to compete. Unfortunately, not all services can be enjoyed in some country. Although starting relatively old, Tegra 2 is still giving good performance and can compete with other dual core SoC on the market. Compared with Qualcomm MSM 8260, looks Tegra 2 has better graphics performance. 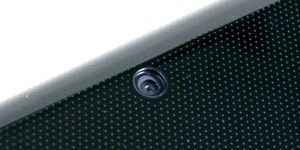 The main camera on the tablet computer has a resolution of 5 Megapixels with the ability to record full-HD video. 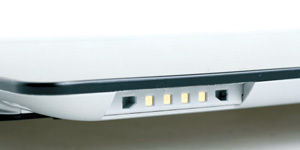 The charging port is also designed differently. Unlike other tablet computers, the Sony Tablet S using regular SD card for storage expansion needs. Plus: good screen, good performance, Playstation certification. Minus: The protective layer of the screen is less convincing, does not support USB Charging.